Chapter 12: Attack! Titan Junior High School! The Chapter starts with the last moments of the past chapter. When everyone remembered the shameful way of the human…How they have to trap themselves in terror against those monsters they call Titans. Everyone feels sad and miserable, but Eren has decided something: He will go and face the Titans and will get the Burguers back! The teachers refuse that and says that they must go back to their classroom on this instant! Still Eren has decided to keep going forward! The Teachers continue and says that everyone who refuses their commands will be kicked out! Suddenly Christa, Ymir and the rest of the Gang has decided to help Eren and they will block their path while he goes tor ecover what it´s them by right! Eren starts running and Mikasa, Armin,Jean (who still has that snow white), Sasha and Conny goes to the action! And first they will go with the Scouts in order to get help from them! Keith looks at the scene and thinks that Eren is now finally a soldier. Eren and his team go with the Scouts and ask for their help…But Levi and the rest says that they will do nothing, that they will be on Stand by. Eren doesn´t know why and Levi doesn´t explain itself. Armin says that if the Scouts enter in action and they are detected. The club could be disbanded and everyone will be expelled. Still Eren has settled his mind and will go, even if it´s alone. He is about to leave but Petra stops him. Levi says that still Eren is not wrong and that of the multiple choices…Eren should just do the one he will regret the least. And wit that Eren and his team is decided to keep going forward! 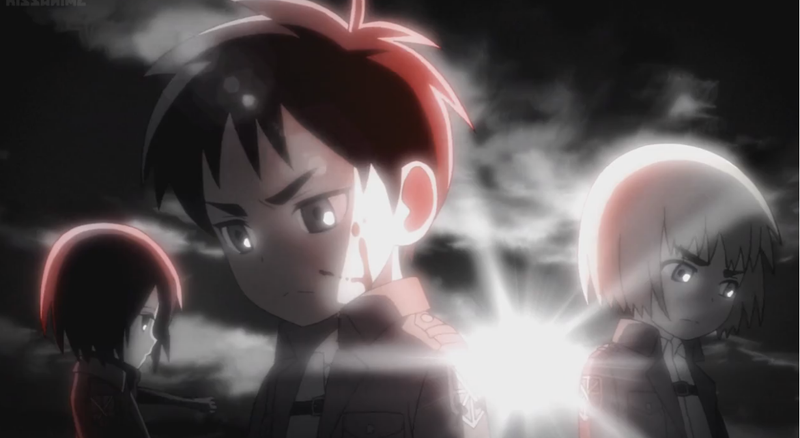 Now Eren´s Team is on the Titan´s Junior High and will get their burguers back! …And before they noticed it they were running for their lives… Good thing that the drunk janitor has come and brought Rico and a random nobody with him! Rico has decided to help them and she has brought the Omnidirectional Gear! The Janitor then decides to give Eren some time and he distracts the Titans… By breaking a window by accident…And falling from it. Ouchies! Everyone remembers the plan… And it´s to go to the principal officer and take a key that will open a door where it will leave them to where the food is! They reach the Principal Office and enter…And In there there is a replica of the town…Ok… The Principal likes to feel like Burns when he wanted to block the Sun. In the middle of the town there it is they Key!...Gian…But a Key none the less! Suddenly 4 Titans appear! Armin says that they will distract them while Eren takes the Key and… that thing is heavy and just don´t get out! Armin and Mikasa comes in and helps him! A Titan comes and Mikasa goes to distract him! At the same time the newspaper club is reporting live! Armin and Eren continues pulling and Armin ask him why is he decided to that? To go straight into hell in order to face the Titans?! Eren responds saying that the answer is obvious…Because he lives in this world!! Conny is in trouble but Jean managed it somehow to save him! Then he tries to run and a Titan is about to eat him! Jean is done for! But Annie and her Titan friend comes in to help! It was destiny! They Key is moving! Eren has pulled it! Now everyone will cover him so he can reach the place where the key hole is!! Eren starts having a something something monologue about something something rules and something something things to gain freedom and something something fight! Everyone keeps distracting the titans and avoiding their attacks! Eren is about to reach the Keyhole but a Titan comes, but Rico and Jean…by being throw by someone, defeat him! Oh don´t cry Rico. Jean is alive and well! Who are those rocking people with eyes bandages?! What is Revo doing in here?! Bwahahahahahaha! Ok… Ok… I calmed myself… Man I truly laughed a lot with that!...I still don´t know why but there was something funny on that. Suddenly the roof starts crumbling. The Principal Titan has appeared… And he wants the burguers! Armin says that this wasn´t a Gym…But a Lunch Box! Eren decides to go and face the Principal Titan and attacks him! Eren is out thanks to the mustard! And has recovered a Burguer! !And remember people, a good burguer has both ketchup and mustard! Humanity is saved! They gained a victory over the titans! Everyone starts celebrating for the miracle made by Eren and his gang! The teachers are amazed by what happened and the one who is closer to the Scouts says that this might looks a little step, but this was a huge victory for the Humans. And a new hope for them to have a Fun School live…And that now it is the time for them, the Teachers to look at the rules they have in order to guaranteed that objective. It´s time for the Humans to Attack!! At the same time everyone is celebrating with Eren and his gang! The Heroes of this fight! One Word. Epic! Epic to the extreme! It was a very good chapter with lots and lots of emotions! From the music, the drama and even the jokes! Everything was Epic on this last chapter! Also, I am not lying. The Scene were Revo appears made me laugh a lot! I was laughing like a mad man for like 5 minutes! There was something in there that made me laugh! Now. This is the final chapter of this Series, it has been an awesome ride this last three months, checking the characters, their names, personalities, jokes and more. I started doing this cover up chapters on this Anime mostly because I am not –and still aren´t-a fan of Attack on Titan , unlike other Anime dedicated webpages whose Reviews mostly focused on the similarities with Attack on Titan original series, I wanted to watch this series with different eyes, not watching how the animators used the references of the original series, but experiment for the first time those scenes on here, not watching how they degraded or made a parody of Eren and the gang, but to know them and experience them on this way! Not making a comparative with Attack on Titan, but to watch Attack on Titan Junior High and weighted it under it´s own charm and traits. Taking that in regard, I cans ay that Attack on Titan: Junior High, while it is far from perfect, it´s a good comedy Anime, where if you don´t care much about a central story, you will find lots and lots of laughs and nice moments! Maybe it´s not half as good as the Original Attack on Titan Anime, but, still, even a little, Attack on Titan: Junior High can shine from it´s own, and I am mostly sure that for the people who did watched the Anime/Manga from where this is based on, you will most likely love it far more than an ignorant on the matter like I did. With nothing much to say now…And since we are on season, I can only tell you this: Happy Christmas and Happy New Year! And I hope to see you again with the next Anime on January!